Story time! So, the last degree I got was a Master of Fine Arts in Creative Writing. In the middle of my degree, I went to one of the field’s biggest conferences, which in 2008 was in Manhattan. I’d been to New York City before, but only as a high-school student on school trips, so this was my first trip where I could do what I wanted, go where I wanted, eat what I wanted. And what I wanted to eat was whatever the heck was cooking in the cart right by the hotel, with its spicy, savory scent and a line halfway down the block. I hopped in line and ordered the chicken, which came on a bed of yellow rice, streaked with a delicious white sauce and a hot sauce that wasn’t messing around. Remembering that one of my classmates had spent time in New York, I tried to tell her about the amazing chicken I’d just had — right there, on the street! — only to be cut off abruptly: “Yeah, I don’t eat street meat.” What! Not to eat that delicious meat, when it’s right there, cheap and satisfying and delicious… well. To each his own. Back in Ohio, I had to content myself with memory alone until New York-based Serious Eats posted a recipe for Halal Cart-Style Chicken and Rice with White Sauce, which is a great piece of re-creation. I made a number of tasty chicken dinners using their recipe. In time, however, I started wanting to address two sticky problems: (1) I started eating less meat, and wanted to figure out how to make this same deliciousness with seitan; (2) I wanted to figure out how to make that white sauce even more garlicky, because I have a garlic thirst that’s all but unquenchable; I’m like an anti-vampire. 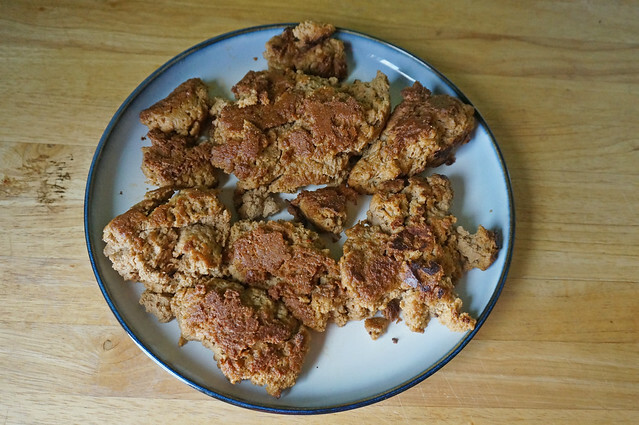 The seitan was just a matter of experimenting, as I learned more and more about my favorite homemade protein — you can’t simply treat it like raw chicken; things get weird. But it turns out it’s even easier and faster with seitan, which you’ll see reflected below. The garlic sauce, though, took a bit longer. I knew what I wanted, a pure and unadulterated creamy garlic condiment. I’d even had something like it at a local restaurant, seasoning a grilled tuna wrap, but it was just labeled on the menu as ‘garlic sauce’ — no help there. Eventually I learned of the Levantine sauce toum, which usually gets described as ‘amazing’, ‘astounding’, and ‘magical’ — it seemed like just the thing. But every recipe I found called for a super time-intensive process, and made 3 cups minimum, which seemed like overkill even to me. Just last month, though, I found a recipe from Vibey at Yumbo McGillicutty that builds on my favorite mayonnaise technique, which is so obvious in hindsight that I’m a little embarrassed not to have thought of it myself. Thank goodness someone did! And so, all the components ironed out, I give to you a rendition of chicken from a New York food cart, vegetarianized and hella-garlicky (because my voracity for garlic far outweighs my consideration for my colleagues — I have my own office anyway). I personally am always happy to eat mobile food — sorry, Catie, but I’m all about the street meat — but now I don’t have to wait for the next time I can get over to the Big Apple. And neither do you. 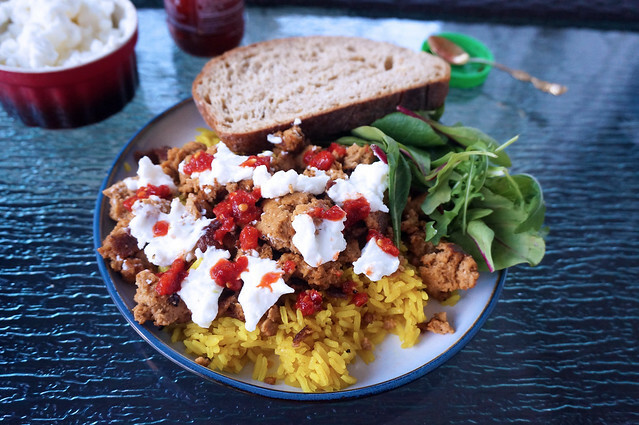 Inspired by memories of some of the best chicken I’ve ever had, from a food truck in Midtown Manhattan, this street-cart seitan is quick and easy, reheats beautifully, and is a complete vegetarian meal, especially if you throw some salad and bread at it. I realize the recipe looks long, but do remember that it’s actually three separate recipes rolled in one! You can absolutely make all the components separately, ahead of time, and combine them for your lunch bag. Seitan and rice adapted from Serious Eats’s Halal Cart-Style Chicken and Rice with White Sauce; garlic sauce adapted from Vibey’s Two-Minute Toum. Combine all ingredients except for the oil in the base of a container only a bit wider than the head of your immersion blender. Blitz briefly till smooth. Add the oil and allow ingredients to settle. Turn on blender and lift it slowly. The mixture will turn into fluffy garlicky sauce, as if by magic. You may need to squish the blender head back from the top to work in some oil floating on the top. Melt the butter in a medium saucepan over medium-high heat and add the turmeric and cumin. Saute for a few seconds till fragrant, then add the rice. Cook, tossing frequently, until most of the grains are opaque, 4-5 minutes. Add the vegetable stock (and the salt, if needed — if your stock is salted, you probably won’t need any at all) and bring to a boil. Cover, reduce heat to low, and cook for 15 minutes, until most of the liquid is absorbed and little divots appear in the surface of the rice. Remove from heat and let sit, covered, for 15 minutes to allow the rice to finish. Fluff with a fork before serving. First, dry the seitan as much as possible. You’ll definitely want to squeeze it in your hands to express as much juice as possible, and will probably want to pat it dry with paper towels as well. 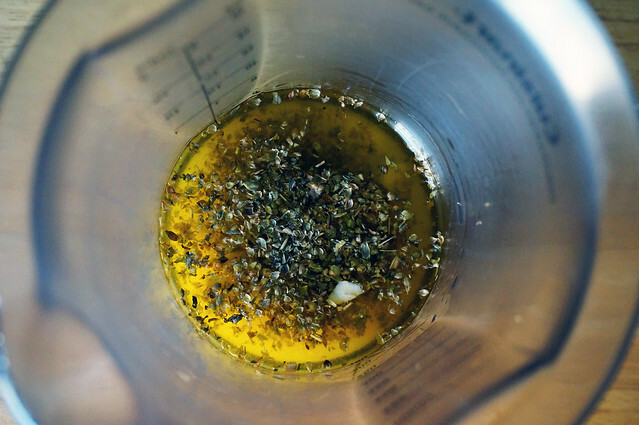 Blend lemon juice, olive oil, oregano, and garlic in a standing blender or an immersion blender, and set aside. In a large skillet, heat the oil over medium-high heat until it shimmers, then add the seitan. (Unless you have a rather large skillet, you’ll need to work in batches so as not to overly crowd the skillet.) Let cook without disturbing until the bottom browns and the seitan chunk releases fairly easily , about 4 minutes. Flip and cook the other side another 4 minutes, adding additional oil if necessary. 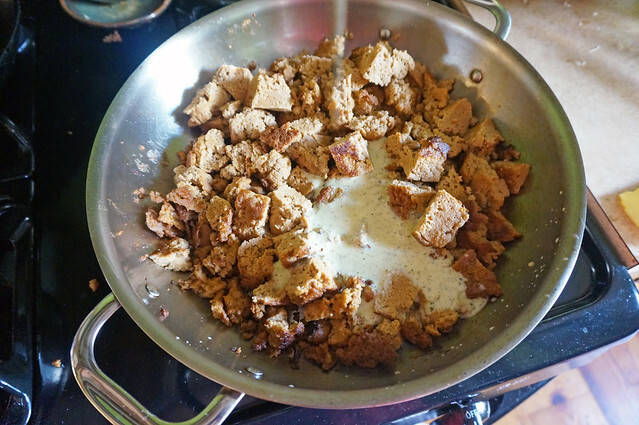 Remove seitan from pan and chop into bite-size pieces. Return to the skillet and add the lemon juice mixture; cook over low heat, stirring frequently, until all liquid has been absorbed. Lay down a bed of rice and top with the seitan, then top the whole thing with garlic sauce and hot sauce. Accompany with a nice green salad and some bread for a complete civilized meal, or eat the seitan and rice out of a Tupperware container at your desk for the full (scrumptious) Midtown Manhattan office drone effect. The garlic sauce, as written, is very garlicky. 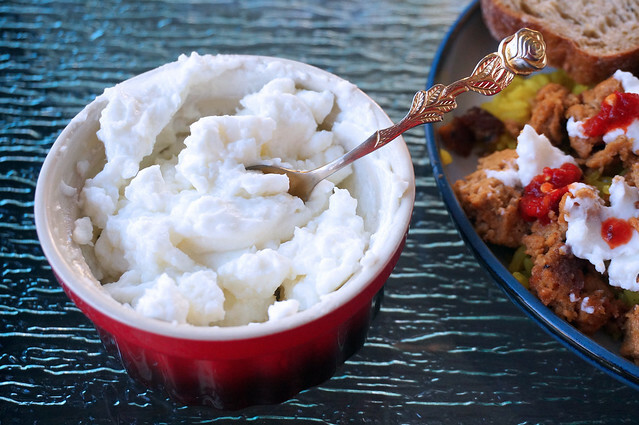 If it’s too garlicky for your taste, cut half-and-half with plain yogurt or sour cream, adding a little salt if it tastes like it needs it. No immersion blender? The garlic sauce should theoretically work in a regular blender, too, with a slightly different method: whizz everything but the oil until it’s a smooth paste, then slowly drizzle in the oil. You can theoretically omit the egg to make a vegan garlic sauce, but the egg white adds a bit of insurance, due to its emulsifying properties. Going slowly is your best bet for making this entirely veganly; don’t raise the immersion blender too quickly, or if you’re using a standard blender, don’t add the oil too quickly. If the thought of pan-frying seitan is just too much, you can actually skip it. 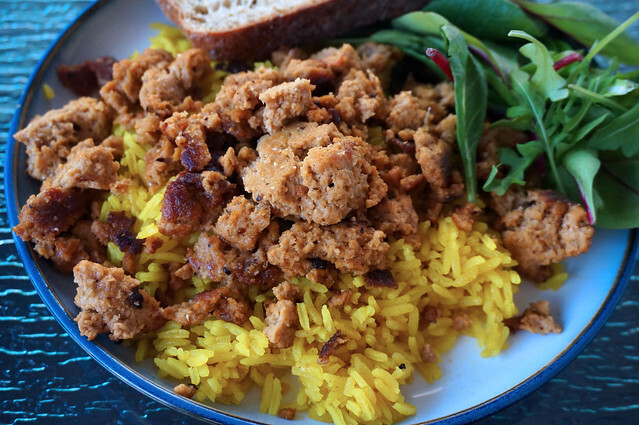 I appreciate the variety of textures and flavors that come from the process, but this dish will still work if you simply chop the boiled seitan and add it to the pan with the blended lemon juice mixture, cooking over low heat until it’s absorbed. I *only* eat street meat. Discretion requires my silence in response.